In 1764, a local Act of Parliament established the Blything Hundred Incorporation of 46 parishes. 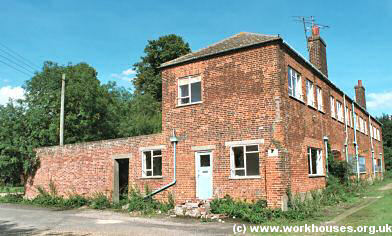 On 18th March 1765, the Incorporation began to erect a "House of Industry" at Bulcamp near Blythburgh. The building was designed by Thomas Fulcher of Debenham and cost about £12,000 including £500 for rebuilding a part that was pulled down by a riotous mob which had to be dispersed by the military. It opened its doors on 13th October 1766 and admitted 56 paupers. 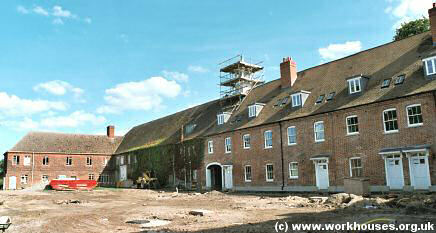 In 1767, the workhouse had 352 inmates in residence. The poor were employed in spinning hemp, carding and spinning wool, weaving linen and woollen cloth for the use of the house, knitting stockings, mending shoes, and cultivating the garden and land. In 1774, income from the labour of the paupers amounted to £529.0s.3d. In the same year, the salaries of workhouse officers (governor, chaplain, surgeons, treasurer, clerk etc.) totalled £398. 4s. 0d while poor rates in the Hundred raised £3084. 12s. 11d. In 1835, the operation of the former Incorporation was severely criticised by Assistant Poor Law Commissioner Charles Mott, who had responsibility for Suffolk. He found that the sexes were not segregated in the workhouse — men and their wives and families were admitted, and their children grew up there until being apprenticed by the Incorporation at the age of 13. After serving their apprenticeship, the sons married and came back with their wives to the workhouse, had children and so repeated the cycle. Mott also discovered that a number of "strange customs" that existed at Bulcamp. A licensed shop for the sale of alcohol, tobacco, tea etc. had been fitted up and allowed to be run by a female pauper in the workhouse. Moreover, the local Excise Officer visited periodically to "take stock". 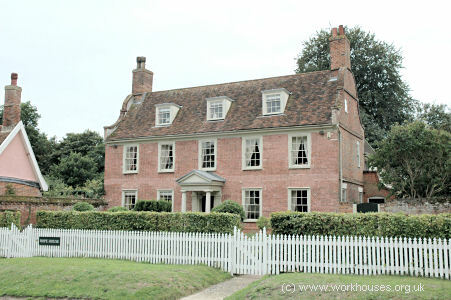 The small farm surrounding the workhouse was used to rear cows from which the paupers were supplied with milk and best butter which the guardians were repeatedly said to declare that they could not get such butter at their own tables as the paupers were supplied with in the Bulcamp House of Industry. The inefficient and profligate management of the Blything Incorporation was highlighted in a comparison with the adjacent Mutford and Lothingland Incorporation which was much commended by Mott for its economy. The table below shows the expenditure on salaries in the two Incorporations. 25 Parishes, Pop. 15,255. BLYTHING. County of Suffolk: Aldringham with Thorpe, Benacre, Blyford, Blythburgh, Bramfield, Brampton, Carlton, Chediston, Cockley, Covehithe, Cratfield, Darsham, Dunwich, Easton Bavants, Frostenden, Halesworth (3), Henham, Henstead including Hulver Hamlet, Heveningham, Holton, Huntingfield, Kelsale (2), Knodishall, Leiston (2), Linstead Magna, Linstead Parva, Middleton, Peasenhall (2), Reydon, Rumburgh, Sibton, Sotherton, Southcove, Southwold (2), Spexhall, Stoven, Theberton, Thorington, Ubbeston, Uggeshall, Walberswick, Walpole (2), Wangford, Wenhaston (2), Westhall, Westleton (2), Wissett, Wrentham (2), Yoxford (2). The population falling within the Union at the 1831 census had been 25,303 with parishes ranging in size from Easton Bavants (population 16) to Halesworth (2,473). The average annual poor-rate expenditure for the period 1832-5 had been £21,979 or 17s.4d. per head of the population. A single-storey entrance block stood at the north of the workhouse site. Blything entrance block from the south-west, 2001. The two-storey main building was built in red brick and had an H-shaped layout. Blything front of main building from the north-west, 2001. Blything west side of main building from the north-west, 2001. A chapel was located at the south of the east range. Blything chapel from the west, 2001. There was a workshop block at the north-west of the site. Blything workshops from the south, 2001. The Union had its own farm at the south-east of the workhouse. 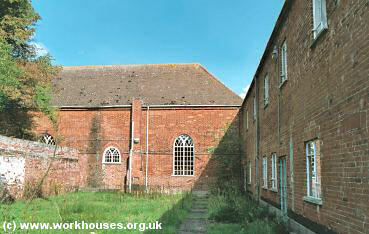 It provided the workhouse with fresh cheap food, and employment for the inmates. After 1930, the workhouse site was renamed Red House. In 1948 it became Blythburgh and District Hospital and provided care for the chronic sick. In 2001, the site was redeveloped for residential use. By 1913, the union had opened a children's home at Hope House on Yoxford's High Street. In 1924 it could accommodate 35 children, with Miss E Dowsett as Superintendent. 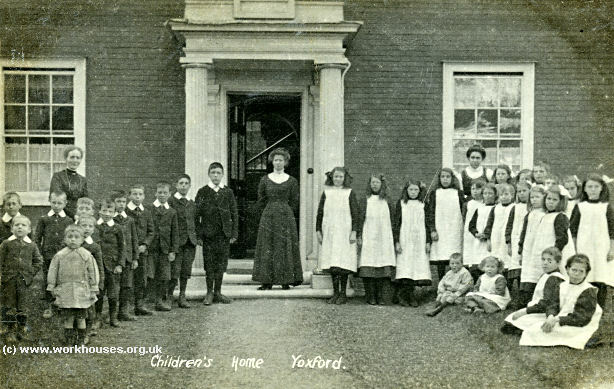 Union children's home at Yoxford, c.1913. The building is now a private house. Former union children's home at Yoxford, 2006. By 1929, the home had moved to new premises at Halesworth where 40 children could be housed, still in the care of Miss Dowsett. Suffolk Record Office, Gatacre Road, Ipswich IP1 2LQ. Holdings include: Guardians' minute books (1764-83, 1790-1802, 1901-30); Births (1914-34); Creed registers (1889-1934); Offences and punishment book (1914-31); etc.